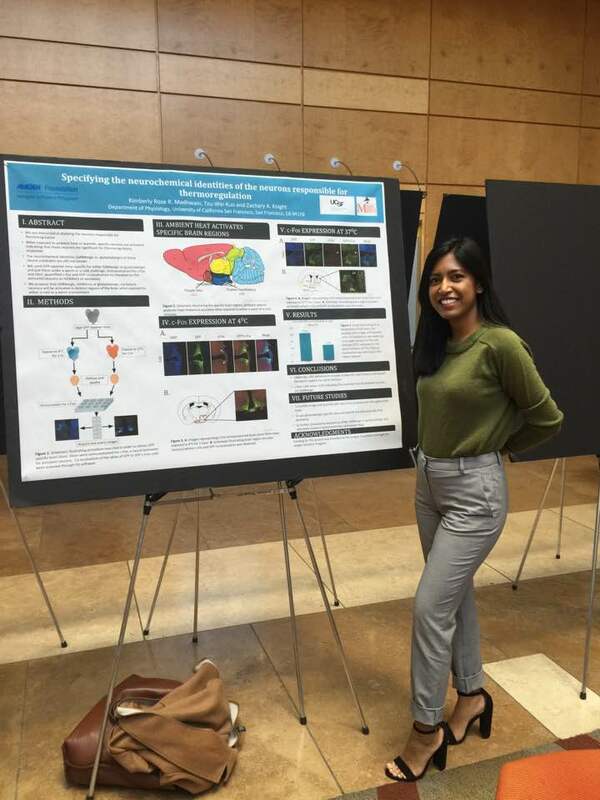 CSUN biochemistry major Kimberly Rose Madhwani displays a poster summarizing the research she conducted at a research symposium as an Amgen scholar at UC San Francisco. Photo courtesy of Kimberly Rose Madhwani. Kimberly Rose Madhwani is having a hard time adjusting back to the warmer climate of the San Fernando Valley. For 10 weeks over this summer, the California State University, Northridge student conducted research at the University of California, San Francisco (UCSF) as part of a scholarship program hosted by the Amgen Foundation. The program pairs 17 leading educational and research institutions across the United States, Europe and Japan to host scholars in research labs. Madhwani, a fifth-year biochemistry major and president of CSUN’s Chemistry & Biochemistry Club, first heard about the scholarship when she attended a conference hosted by the Society for Advancement of Chicanos/Hispanics and Native Americans in Science. She was one of about 360 applicants chosen from more than 5,000 applications. Madhwani was thrilled when UCSF selected her for the program, where she conducted research, studying the underlying neural circuits responsible for thermoregulations. The scholarship application required her to write a diversity statement, where Madhwani explained how her upbringing was perfectly suited to a career in medical research. After conducting research during the past three years, Madhwani said she appreciated the opportunities CSUN opened up for her — including this scholarship that allowed her to experience a different city. She encouraged all CSUN students to try to find scholarships, to show others what great scholars the university can produce. Scholarships like those offered by Amgen can help students discover new opportunities and realize their dreams. Madhwani described how her time at UCSF has prepared her for a career in medical research, as well as helped reaffirm her beliefs in just how much she can accomplish in the field.